So I just purchased this van two weeks ago, previous owner said some work on the radiator was recently done. I can't remember what it was. Since I've owned it the temperature gauge really never goes up nor down very much but the heat worked fine. Now suddenly the heat only blew hot when idling. I couldn't check the coolant at that moment because I was running late but on the way home my check engine light came on and temperature gauge was in the middle. Of course I pulled over but without letting it cool I couldn't check the coolant. I popped the hood to see if I could at least see any in the reservoir. Looked pretty dry so I called a friend who told me it would be okay to pour some directly into the reservoir. Where it leaked into the ground as I poured. I was later able to open the radiator cap, start my van (with cap off) and fill it. What is wrong? Thermostat? Or something more severe? You need to do a pressure test on the system to determine the source of the leak. Then it needs to be repaired and filled with coolant and see if the heater works again. I would suggest a thermostat as well. I got a notice of a response but nothing showed up? Hmm I'm not sure why. I said "good morning and thank you so very much!" The wonders of computers, LOL. If the added coolant just poured out onto the ground it sounds like the reservoir has failed. That reservoir holds the coolant that pushes out of the radiator as the vehicle warms up. Then as the engine cools it is drawn back into the engine through the thermostat to keep it full to help prevent corrosion and keep the system from developing an air locked heater core. If it failed the coolant would push out, then when it cooled it just pulls air back in. Then the next time you run it that cycle repeats and you get no heat because the coolant level is low. Once air gets into the system you get erratic operation and poor cooling as the coolant can "miss" areas as it is low and has air in the system. It's likely either a cracked reservoir or the hose to it has failed. 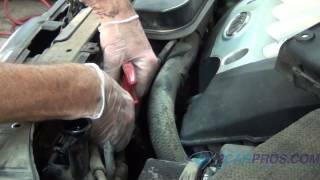 2003 Dodge Caravan Radiator Leak? How Can I Tell If The Radiator Is Leaking?